« Are We In A Recession Already? Bernanke’s Moment of Truth: 25 or 50 bp Cut? The market is drifting higher this morning, as it tends to do ahead of Fed meetings. This is the defining moment for Bernanke. The first chance he will get to create his legend and legacy. With the upcoming release of his memoirs, Greenspan has been all over the news with attention grabbing sound bites. He pontificates on a lot of topics that he was silent about during his tenure as the “Maestro”: tax cuts, the Iraq war, the mortgage and housing market, etc. Interesting that he only speaks out now when he is enjoying the freedom of retirement. When had the power to actually do something about these things he was conspicuous in his silence and acquiescence. In any case, today, Helicopter Ben finally gets the limelight. 25 bp or 50 bp? At 2:15 Eastern time we’ll find out. A 25 basis point cut is a foregone conclusion since it has been priced in 100% since mid August by the Fed Funds futures market. Meanwhile the same market tells us there is a 75% chance of a 50 basis point cut. Personally I think they should go with the latter. Not because I’m talking my book, but rather because that’s what the bond market is saying. Right now the 90 T-Bill rate is around 4.05%. While the Fed Funds rate has been 5.25% since June 29, 2006, since this spring, the bond market has been signaling repeatedly that it should be lowered. What do you think will happen? No cut? 25 bp? 50 bp? A prolonged gap of around 100 basis points is simply too much. The Fed doesn’t have a choice. They have to lower the rate. If they don’t it will be a market shaking decision and as far as I know, the first time they have decoupled from the fixed income market. I find that highly improbable because the short term T-Bill rate leads the Fed by the nose. Of course the Fed would hate for this to get out but it is the truth. Each and every major trend change in rates has been preceded by the free market and later followed by the Fed. That isn’t hard to fathom once you realize the incredible power of free markets for price discovery. To see what I mean, click below to see a long term chart of the Fed Funds rate along with the 3 month T-Bill rate. Your graph shows correlation, but correlation is not causation. The short-term T-bill rate is driven by simple supply and demand of T-bills. But where does that supply come from? The government. 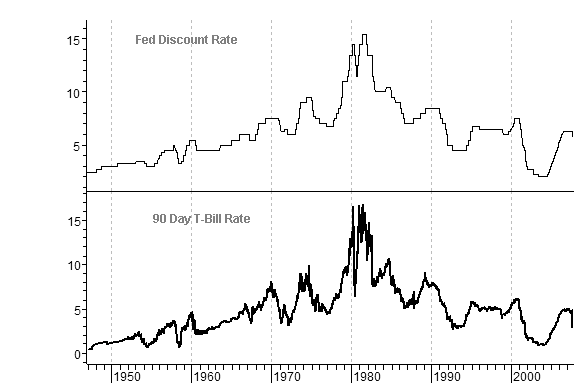 If the government controls the supply of T-bills, then it controls the rate, NOT the market as you imply. Isn’t your argument thus a chicken- and- egg argument? what the govt doesn’t control is demand. And because of that there is only an illusion of control. It is not easy to see in the graph but T-Bills move before Fed Funds. Just look closely. A good example is in early ’70s. Well…not that I mind a 300 DOW day … I’m long (or was) heavily and did well today, but I wonder about the dollar. Has it become irrelevant?